As a general rule of thumb, we almost always recommend that a gun be concealed on body, as opposed to in a purse, bag, or another off-body carry method. Depending on your body type, however, you may run into some difficulties actually concealing your gun on you. So, this next method of concealing your firearm on your body may be just what you're looking for. As far as ‘on-body' carry options go, we usually focus on traditional methods like holsters. Any internet search for concealed carry holster options will undoubtedly result in some non-traditional methods of carrying. I wanted to test and evaluate one such niche, and that is clothing with an integrated ‘holster' that attaches to the fabric itself. This time around, we are looking at the Ridge Footwear Packin' Tee shirt. However, there are more options than just t-shirts out there. Available concealed carry clothing comes in the form of shorts, pants, and even underwear–all with integrated holsters for your firearm. To make it more interesting, I thought I'd examine a product from a different point of view: that of a woman concealed carrier. If you haven't noticed, I'm not a woman, and rather than going through an expensive (and what I imagine to be quite painful) surgery to understand the unique considerations facing women concealed carriers, I opted to enlist the help of my wife. I asked her to test and evaluate the ‘Packin' Tee Shirt from Ridge Footwear, while I just record her findings. Why am I doing it like this instead of just ordering a men's shirt? I find that while these clothing products are marketed for both men and women, men can typically make traditional carry methods (strong-side hip, appendix, etc.) work easier, causing women to be more drawn to these types of alternative methods of carrying. Ridge Footwear is a company that makes an unbelievably diverse number of products for the outdoor sportsman, and a quick visit to their website will show this massive catalog of gear. As stated a moment ago, this concealed carry shirt is available for both women and men, and comes in various sizes and two colors, black or white. The Packin' Tee Shirt is made of pre-shrunk cotton and designed to fit tight, like a compression shirt. The holster is not permanently attached. Rather it has Velcro patches attached on either side, allowing the user to configure it for their strong-hand draw. 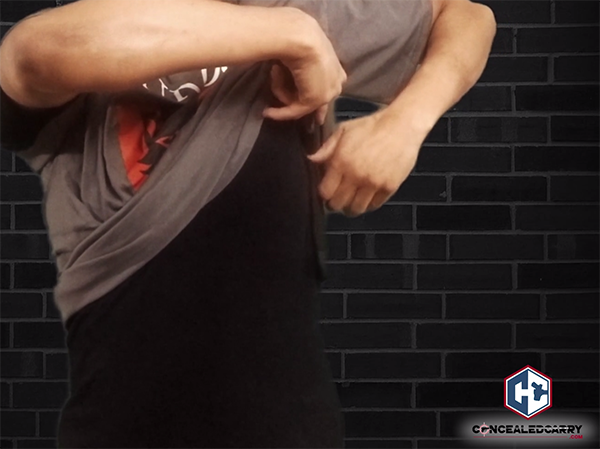 The holster area is located in the torso section of the shirt roughly 4″ below the wearer's armpit. The holster component is basically a pouch that the gun fits in, which is backed by Velcro. This allows the gun to be worn on either side. You can also purchase an additional pouch to carry a second firearm, or probably more practically, travel documents or money you may want to safeguard. Impressions from my wife: The shirt is a very nice material and seems to be sewn and made well. The shirt is comfortable, but if you have never worn a compression shirt, it takes a bit getting used to, as it was designed to be worn tight against the skin. I tested the shirt with my Beretta Pico, which is an exceptionally small and lightweight firearm. The shirt did not sag, and my firearm stayed put in the holster. I would imagine that anything larger than a micro-compact may begin to test the shirt's ability to hold the gun tightly against the body. As far as the Velcro is concerned, it was extremely strong and there was no concern of it coming loose. The fact that the shirt held the gun against the skin, had me thinking that preventive maintenance would be of extra importance, as the gun was likely to be exposed to more skin oils and sweat. The gun must be worn in a cross-draw position, which, while not my ideal carry position, is no different than a shoulder holster. An important note for those of you who are concerned with the speed of the draw, is that I would not think of this as a primary everyday carry method. It's not practical for most people to own a different holster for each day of the week, and you would need several different shirts to make it work. Furthermore, this would be a concealed carry option for deep concealment. 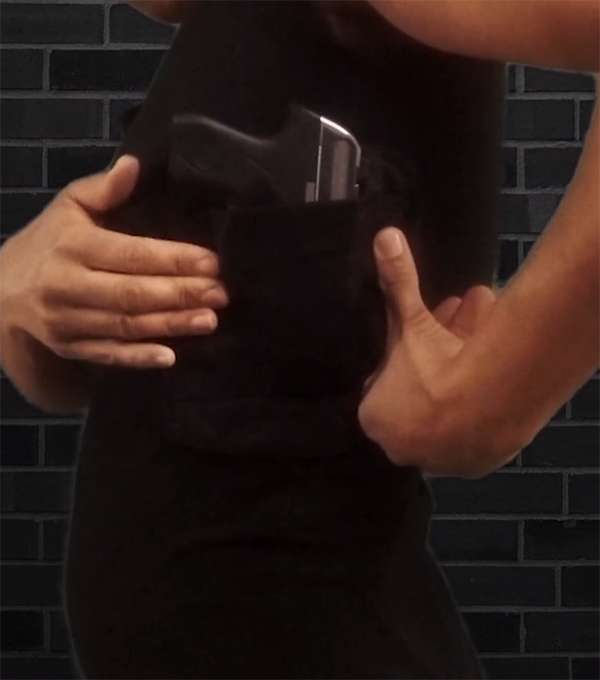 This method would be for those specific times when carrying a firearm in a traditional holster may be impossible for whatever reason. Plus, it's understood that when using a deep concealment option, the speed of draw is compromised for added concealment or comfort. I found that after some practice, I could get to the gun, but it was obviously slower than carrying on my hip. I wore a cover shirt over the Packin' Tee Shirt and accessed my firearm by going under my cover shirt. Another option would be to wear a button up shirt or dress and access the gun from the top. In a pinch, you could obviously pull the buttons away to access the firearm. Both options require training and more time to draw. The material around the trigger guard is not necessarily reinforced but it is pretty thick. It is not impossible to manipulate the trigger through the material but I did not find it a concern as I carry a DAO gun. Overall, I like the shirt for those specific times I may not be able to carry in my holster, but I know in doing so, I sacrifice speed of draw. We do want to point out here, that it is important to train and develop muscle memory for your method of carrying a concealed gun. That way, should the time come, you'll be better prepared to defend yourself and family. You can learn more about the Packin' Tee Shirt and other products from Ridge Footwear here. 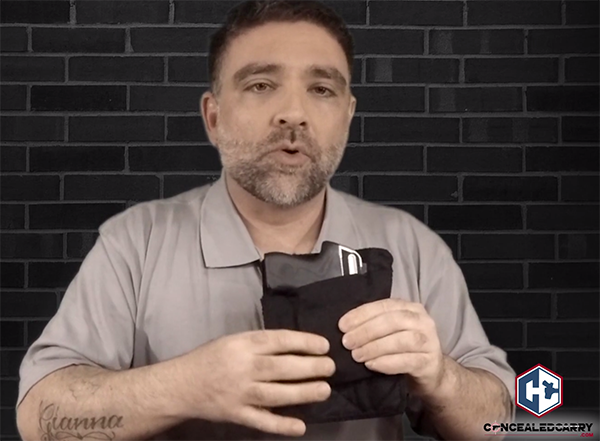 For more on concealed carry clothing, and some talk about printing and how to make it look like you're not carrying a firearm, make sure you give this next article a read: Are your clothing adjustments really alerting others to you carrying a concealed firearm. I wear these all the time. I bought shirts that have snaps that look like buttons to wear with these. There is little compromise in speed. They work better than any other method in a car, easy access and doesn’t throw you back out of position. I have carried all day with a variety of pistols like my beretta 92 and Bersa UC 9mm without any problems. I could go on, but I will just say they are worth a try.